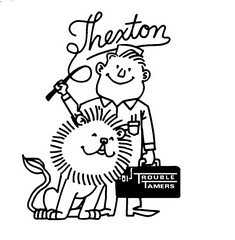 Thexton Manufacturing is currently celebrating their 108th year in business. The company designs, manufactures, assembles, and packages more than 100 automotive tools, testers and repair kits from its facilities in Bloomington, Minnesota. Through its history, Thexton previously employed a racing celebrity. Prior to WWII, Joe Dawson joined Thexton as a sales representative calling on warehouse distributors & jobbers in Ohio, Pennsylvania & New jersey territory. Described in some newspapers in the early days of racing as Smiling Joe Dawson, he captured the 1912 Indianapolis 500. It was the second running of the Indianapolis 500 and the great Ralph DePalma and his Mercer were heavy favorites. But, when DePalma’s Mercedes broke down with two laps to go, the winner, finishing ahead of a FIAT, was “Boy Driver” Joe Dawson in a 460 cubic inch National. Dawson worked as an engineer for Marmon, but was loaned to National to drive their car for the 1912 race and set an average speed of 78.719 MPH for the 500 miles. Ray Herr was his riding mechanic. His last trip around the brickyard was behind the wheel of the 1928 Indy Pace Car, a Marmon 8. It was a victory that would benefit Thexton, because when Dawson’s racing career drew to a close, he became a Thexton sales Representative. Dawson was a true racing celebrity and among his wins were the Indy 500, the Coble Cup in 1910 and the Indianapolis 200. 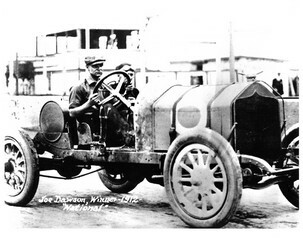 In one of his last races, the 1925 500, Dawson finished 14th. As the twenties came and went, demand for auto related parts grew and Thexton found itself drawn into the automotive field. One hundred years ago, however, it was all blacksmiths and shadetree mechanics. In fact, some historians claim 1907 was the year of the first service station. That year, in Minneapolis, Henry Thexton from North Dakota and Eugene Day from Minnesota’s Iron Range got together to form a new company. Thexton was the businessman and Day, the financial partner. Since their first product was a postage stamp vending machine, they named the new venture the Thexton Vending Machine Stamp Company & located it in downtown Minneapolis, just off the loop on Third Avenue. Soon, however, they were also making foot-warmers for steam radiators and becoming a tool & die maker & the manufacturer of specialty metal stampings. The automotive industry hadn’t arrived, but it was coming. As Henry Ford’s 1907 Model K gave way to the mass production of the Model T in 1909, it ushered in the automotive aftermarket. By 1915, over one-half million Model T’s were being sold. And in 1916, the one million mark for U.S. passenger car production was passed for the first time. In 1931, the company introduced the Thexton piston expander. With Dawson on board, the new automotive tool began setting record sales. By the mid 1930s, piston expanders could be found in service stations & machine shops coast to coast. Following World War II, the company grew quickly as OHV sixes & V-*’s spread throughout the industry. And Thexton’s bolt-on Rocker Arm Oiler Kit became a leading seller. Then, in 1964, came Thexton’s Cold-Chek, a breakthrough in anti-freeze testers. It was the first accurate, inexpensive specific gravity tester which compensated for hot or cold coolant. The Cold-Chek added to a reputation already established as a manufacturer of specialty tools invented by mechanic customers. Loren Tichy started working at Thexton in 1934. Before purchasing the company in 1956, Loren worked for 22 years at Thexton occupying several positions. Loren started in assembly and moved from book keeping to sales manager before purchasing the company. Over the years Loren developed Thexton into a successful automotive specialty tool company. Loren retired in 1979 selling the company. Today Thexton is owned and operated by Loren's son Brian Tichy and grandson Ross Tichy. 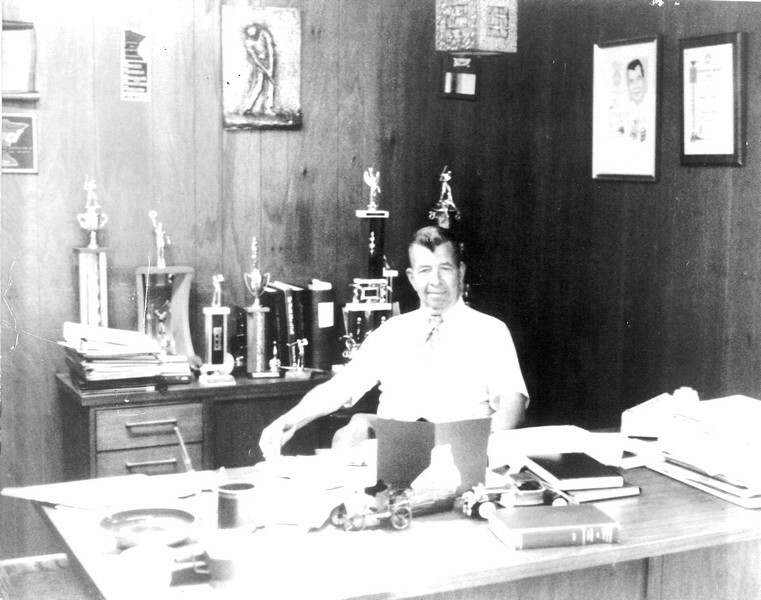 Loren is pictured at his desk below.